High Adventure on the High Seas! Young Jim Hawkins and his friends set sail for Treasure Island, hoping to find the buried loot of Captain Flint, fiercest of all the pirates. But, unknown to them, the crew of their own ship is made up of Flint's former crew, led by the evil one-legged pirate Long John Silver. Once on the island Jim and his friends must find the buried treasure and escape before the pirates capture them. 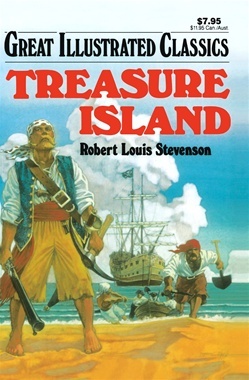 Robert Louis Stevenson's timeless tale of greed and gold remains the most exciting adventure story ever written.